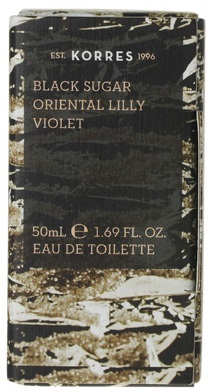 The characteristic aromatic signature of Korres Black Sugar Oriental Lily Violet Eau De Toilette Sugar balanced with the sweetness of oriental elements is a the dotted line defining the distinctive freshness and the powdery sensation of Oriental Lily and the lively, intoxicating character of Violet and Vanilla. The starting point is sweet. The top of this aromatic experience reveals a combination of warm, rich notes which include Caramel and Amber. which lay way to a symphony of notes that are full with a sweet sense of female power.